Scientists and engineers at the first synchrotron radiation source in the Middle East have begun commissioning, a major milestone before officially starting operations in 2017. 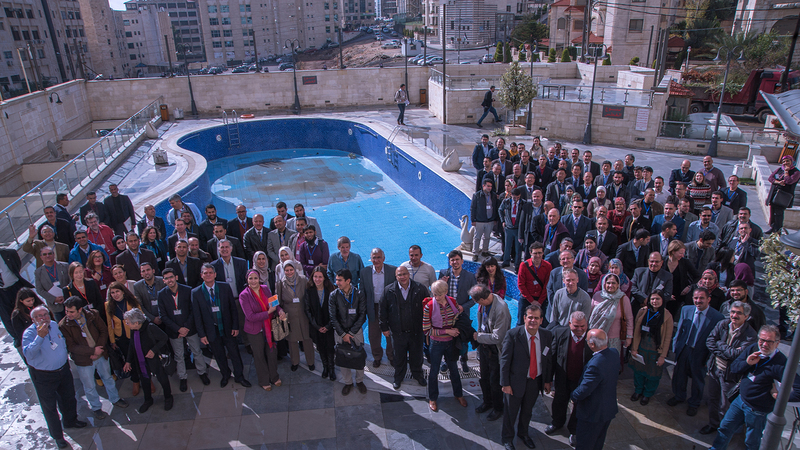 When fully operational, the facility in Allan, Jordan, called SESAME, will mark a major victory for science in the region and also for its international backers. Like CERN, SESAME was established under the auspices of UNESCO, but it is now an independent intergovernmental organization and aims to facilitate peace through scientific collaboration that might supersede political divisions. Countries and labs the world over have responded to that vision by contributing to SESAME’s design, instrumentation and construction. SESAME, which stands for The Synchrotron-light for Experimental Science and Applications in the Middle East, is a 133-meter circumference storage ring built to produce intense radiation ranging from infrared to X-rays, given off by electrons circling inside it at high energies. At the heart of SESAME are injector components from BESSY I, a Berlin-based synchrotron that was decommissioned in 1999, donated to SESAME and upgraded to support a completely new 2.5-GeV storage ring. With funding provided in part by the European Commission and construction led by CERN in collaboration with SESAME, the new ring is on par with most modern synchrotrons. Now that the machine is largely complete, technicians can perform quality testing before researchers gain access and determine whether the light source can accomplish its scientific mission. “The first scientific mission of SESAME is to promote excellence in science in the Middle East,” says Zehra Sayers, chair of SESAME’s scientific committee and also a faculty member at Sabanci University in Istanbul, Turkey. Over the past decade, SESAME has organized regular users meetings each year to discuss and develop proposed research plans. That community is now over 200 strong. The international facility hosts members from Bahrain, Cyprus, Egypt, Iran, Israel, Jordan, Pakistan, the Palestinian Authority and Turkey. Dozens of synchrotrons in other locations throughout the world have already proven themselves as research hubs. Synchrotrons create ultra-bright light radiation and channel it into instruments used for advanced imaging research, with applications ranging from materials science to drug discovery. No synchrotrons existed in the Middle East until now. Political turbulence can make access to other facilities abroad challenging. Sayers says she is confident that SESAME will fill the need for a local laboratory. The new facility creates an opportunity for regional scientists to collaborate, for example, to study shared cultural heritage. The SESAME light source will be used to identify materials in ancient, cultural artifacts such as textiles and dyes, parchments and inks, and could reveal new information about how the materials were originally prepared. Researchers will initially have access to two beamlines of different wavelengths when operations begin. The facility has capacity for 25 beamlines, and it is expected that within a year two more beamlines will become available. As beamlines are added, the number of applications will grow to encompass diverse fields such as archeology, molecular biology, materials science and environmental science. The potential diversity is one of SESAME’s greatest strengths, says Maher Attal, who is coordinating the commissioning process. Twelve straight sections of the machine have the capacity for installing insertion devices, series of small dipole magnets that tune the spectrum of the emitted synchrotron light. This makes SESAME a “third generation” light source. SESAME’s materials science beamline, which will come into operation in 2017 or 2018 will be the first to be supplied with light from such a device. SESAME is undergoing a period of testing and quality control that usually takes several months. After technicians install and test the individual components, they will guide the beam through the whole machine at low energy to allow scientists to perfect its alignment, then to make measurements and corrections if its performance deviates too far from predicted values. The machine then must pass the same inspections at its maximum energy before the synchrotron officially opens. “We expect to deliver the first photon beam to the users in April 2017,” Attal says. Scientists will be watching and waiting.